18. 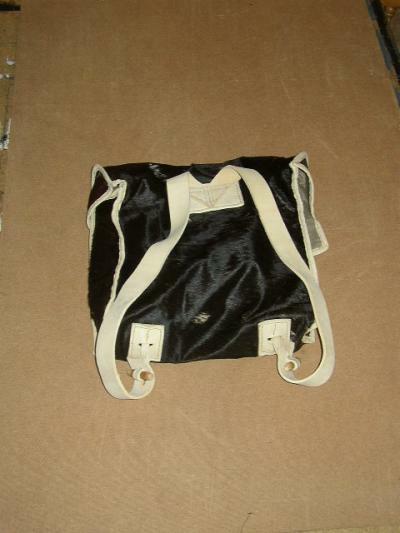 The haversack; in calfskin after curing, one foot deep in the interior, width 17"; two sides of 4" by 16" high; the cover-flap is 18" wide; the sac is 39" in circumference, comprising the cover-flap, two "ears" of the flap 10" long by 3.5" high in the centre; the lining of the haversack is in unbleached linen, and with a partition in the same, of the same length and depth as the sack, a slit 6" long edged with lambskin, in the cover 'flap, with two ties of lambskin; the cover- flap and the front of the sack is edged in lambskin; the sack closes with three straps in buff, 7.5" long 1 " wide, three tinned iron buckles, with 1 " openings enclosed by buff straps with keepers, the carry-straps are in buff 26" long by 16 lignes wide, stitched squarely 1 ' apart with a re-enforcing piece inside the skin in buff, and also attached, in buff, is a strap 9 lignes wide folded to 3 " high (this is a carrying strap), on the front two toggles in wood are attached to 2.5" squares in buff, to attach to the carrying straps. 17. Sac a distributions. In raw undyed linen cloth; length 4 feet 10 inches, width 28 inches; the stitching pressed down except at the end which is open. 47. Form of the backpack. The backpack is divided into four compartments: that of the front and back (depth) are separated by a piece of raw linen cloth. The third compartment ( 1) is situated to the side of the pack, and is designed to take the soiled linen, and finally the closing flap contains a pocket which forms the fourth compartment. Note 1. This compartment does not exist in later models of backpack. rolled together with the comb, the stock, and the spare gaiters. Over the gaiters, are placed the trousers turned inside-out carefully folded along the length of the sack. Placed within the trousers are the martinet, and the button stick, making sure that they do not dirty the trousers or injure the body of the soldier . The black gaiters, turned inside-out and folded, the gusset within are placed over the trousers, one beside the other . The "bundle" (trousse) is placed in one of the comers of the sack. The front compartment is designed to take the bread, salt, cooked meat etc. The interior sack encloses the soiled linen. The lining pocket of the lid contains the shoes; -the leather polisher (astic) wrapped in paper; -scraper (curettes); -a small bag of wire-wool or emery; -the shoe-brush, wrapped in paper or a piece of cloth; -the box of grease; -the wax for the cartridge box; -a small bag enclosing the "Spanish white", the pipe-clay, the rottenstone (Tripoli); -a sponge or piece of cloth. It is placed on top of the backpack, under or over the greatcoat, rolled to a proportional size;but this method has its disadvantages; it offers a poor look, and it is difficult to obtain uniformity .Besides, in case of a storm, it is necessary that the soldier quickly removes the greatcoat,and re-attach the linen sack, and then the sack becomes soaked by the rain, accordingly it becomes heavier and because of the dampness it no longer serves as a sleeping bag. For this reason it is better to enclose it in the interior part of the backpack, where it forms and division between the clothing proper and the shoes and the necessary tools. Note 1. Reglement de campagne du 5 avril 1792 title 1, article 5. To place the linen sack, it is folded in half along its length and rolled loosely and used to cover all the objects contained within the backpack. 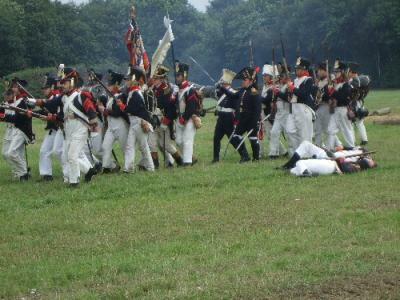 But if the regiment is to travel in greatcoats and put the habit in the backpack, then it is necessary to place the linen sack on the cover of the backpack fixed there by the greatcoat retaining straps, and the folded habit the lining outermost replaces the linen sack in the backpack. 50. The greatcoat. fold along its length and place the sleeves beside each other, not upon each other, so that the volume of the greatcoat when rolled is equal on both sides. Lay the coat flat and fold the right and left sides of the cloth in to conform to the dimensions of the backpack measured across its width. Roll very tightly the coat, beginning at the collar, stop 6 inches from the bottom edge of the coat this last part is used to form an envelope to enclose the coat. stitched and united to said straps. When it is necessary to fix the coat by means of the straps, the strap is pulled through the buckle, but the excess strap is not allowed to hang loose, this end is passed through the keeper, not from bottom to top but from top to bottom. The strap is rolled tightly, and forms a solid full spiral. The haversack shall be in hair-on calfskin well "split". It shall be composed of the part forming the body of the sack, the lid, the two sides of the sack, two " ears " , the lining in linen, finished with buff and with carry-straps for the gratcoat. The side pieces have pieces 160 by 90mm attached. The lid has two "ears" 100mm by 130mm wide measured at its base. The lower edge of the lid is 130mm from the edge of the ears. 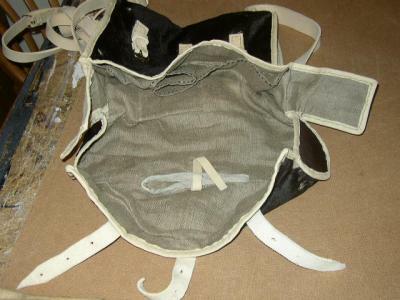 The "height" of the sack, the ears and the lid are bordered with buff. 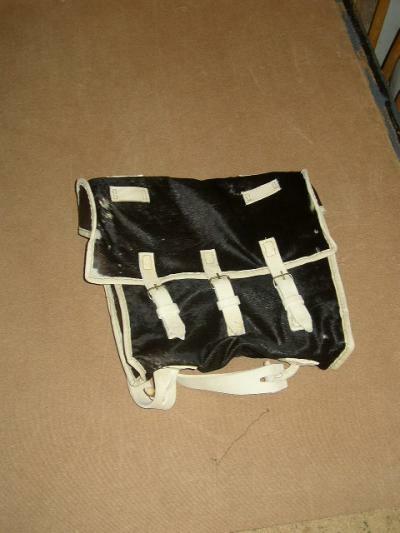 The sack closes by three straps, 200mm by 25mm stitched to the bottom of the lid, one in the centre, the others 100mm from the central stap, attaching to three tinned buckles 25mm wide, held in place with a buff strap and keeper. The height of the buckles shall be 160mm from the upper edge of the sack. The strap of the exterior buckles shall form part of the piece of the buff which holds the toggle to support the carrying straps. The carrying straps are in buff 700mm by 40mm stitched alongside each other, with two horizontal stitchings and two diagonal stitchings of 60mm each. They are attached to two wooden toggles, fixed 220mm apart, with a buff strip lOmm wide stitched into the middle of a piece of rectangular buff. On each side of the lid, parallel to the front edge are two holders to take the greatcoat straps. These are 70mm by 25mm stitched 50mm from the side of the lid. The greatcoat straps are 650mm by 25mm with a tinned buckle. passes over the middle (of the sack).